Today NVIDIA announced the GeForce® GTX® G-Assist™, which takes advantage of cutting-edge NVIDIA Artificial Intelligence technology to deliver the next revolution in PC gaming. Based on a new custom GeForce SoC (Supercomputer on a Chip), the GeForce GTX G-Assist helps you easily eliminate “away from keyboard” (AFK) scenarios, overcome the toughest boss battles, and monitor and maintain your peak gaming performance. · GeForce GhostPlay™--You’re 3v4 in an intense round of Rainbow Six Siege, but suddenly there’s a knock at the door. Pizza is here. You can’t abandon your team, but that delivery guy isn’t going to wait forever, so you go AFK. With GeForce GhostPlay you’ll never have to compromise again. Next time you need to step away from your PC, AI-enabled GhostPlay will take over, playing at your skill level for a few minutes until your return. You get your pizza, your team gets your invaluable skills. · Boss Boost™--Given up on beating the Nameless King in Dark Souls 3? With Boss Boost, you no longer have to cower in fear when facing down a god of war. Available once per game, Boss Boost will crush any enemy you desire and automatically turn on ShadowPlay™, so you can share your ‘victory’ with friends. · NVIDIA Nurture™--a landmark intersection of self-care and gaming. Our AI anticipates the needs of a PC gamer and will automatically have food delivered, keep a steady supply of GeForce GTX ENERGY on-hand, and even order thoughtful gifts for your significant other. · GeForce GameTrain™--Starting a new game can be a daunting experience, especially if you’re looking to level up quickly. But watching YouTube tutorials can only go so far. With GeForce GameTrain™ you can now learn from the best game player in the world, honing your skills in-game with helpful pointers and visual cues. 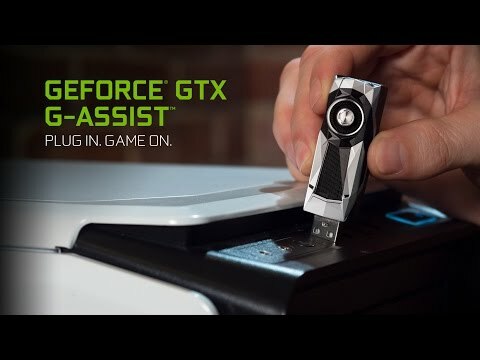 GeForce GTX G-Assist with NVIDIA AI technology will be available later this year from the GeForce Partner Network, which represent a global network representing over 238 countries and territories. Pricing will be announced closer to launch.